For many kids, getting a chocolate orange on Christmas morning in their stocking was something to really look forward to. If you have never had a chocolate orange, I highly suggest trying one. You can find a chocolate orange at most big box retailers or on Amazon. What made them so fun besides them being chocolate, obviously, was the fact that they break open into little orange-shaped slices and they combined the flavors of orange and chocolate very nicely. 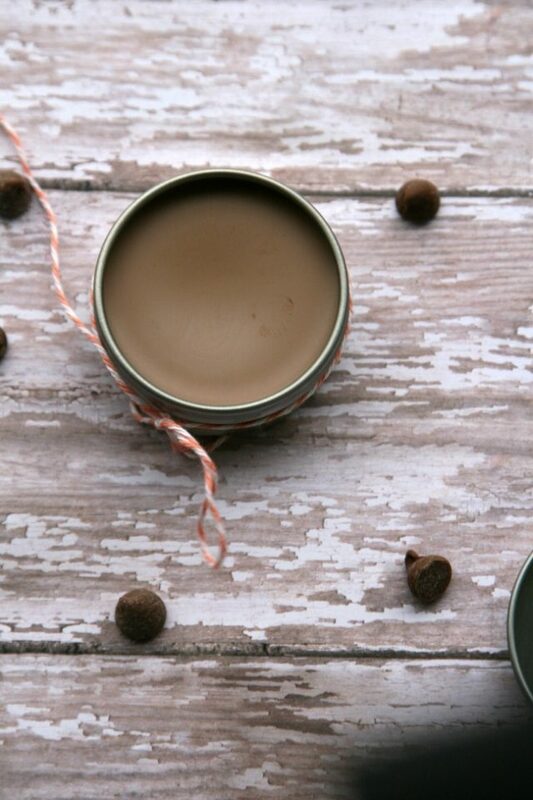 Because of this delicious stocking treat, I was inspired to make these Chocolate Orange Lip Balms. They really do ‘taste’ very much like chocolate oranges. In this recipe, I have icluded instructions to make a bunch. This recipe should make you close to a dozen of these in 1 ounce containers. That’s so you can make them for gifts and add them to stockings! 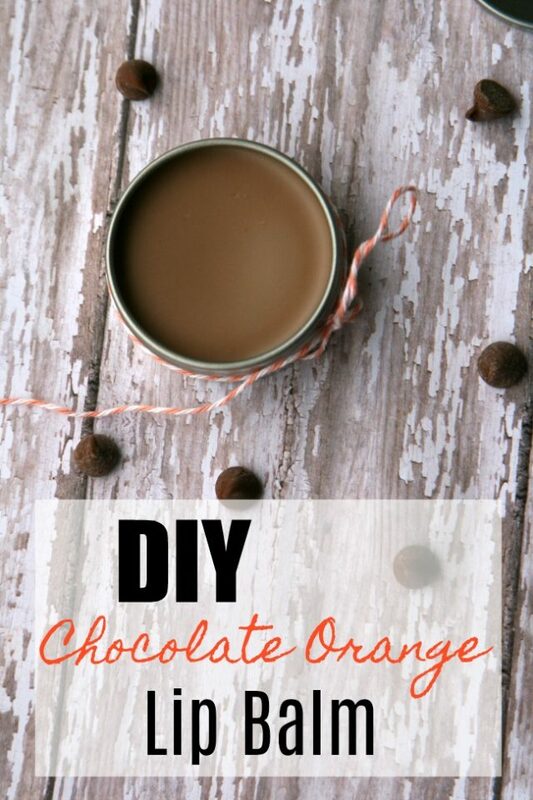 Here’s how to create these DIY Chocolate Orange Lip Balms. You can buy the little lip balm containers for these online. Start by gathering all of your ingredients. This recipe moves fast so you will want to make sure you have everything ready to go. Set out your containers minus lids for easy pouring. 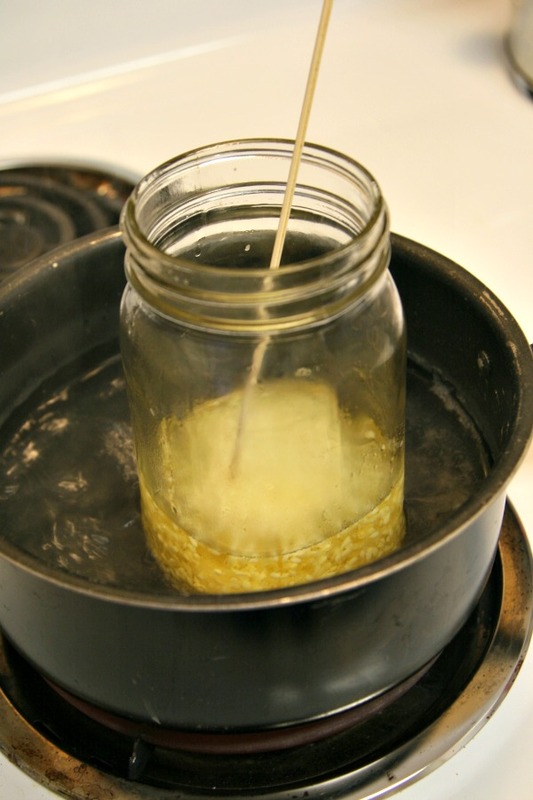 Make a double boiler using a mason jar and a simmering pot of water. I actually use bamboo sticks to stir my mixture because they are disposable and leave me with less mess. I bought an old pot for crafts like this from the thrift store so I don’t have to potentially mess up one of my nice ones I use for cooking. Fill the pot about halfway with water, start it simmering and add your mason jar. 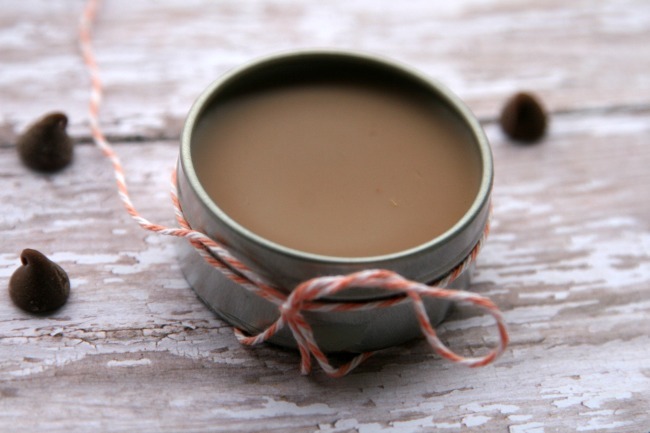 You will want to add your ingredients in this order because of different melting points for the smoothest balm; coconut oil, cocoa butter and beeswax. Make sure to mix everything gently as to not introduce air bubbles. Turn off the heat but leave on stove top. Near the end, when everything is well melted and incorporated together,add in you semi-sweet chocolate chips. They should melt right in with a little bit of gentle stirring. Make sure they are fully melted before pouring into containers. Use care and hold your mason jar with a potholder. Leave lids off until your lip balms are fully hard. This should be less than an hour.